This is rather new to me but I am very excited to be a Guest Designer here, this Sunday. A little bit about me, my name is Joanna Wright......I have a Pazzles Inspiration digital die cutting machine which I LOVE! I bought it here in the UK 2 years ago. I use it for all my cardmaking and really could not live with out it. If you are a crafter you will understand where I am coming from!! 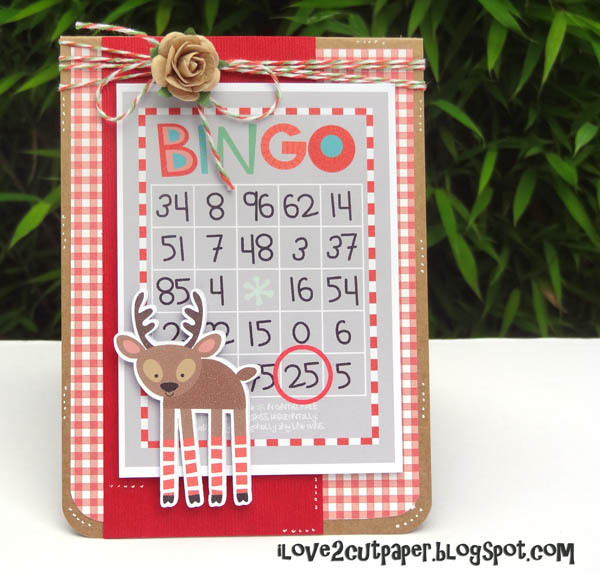 Anyhow, for my project today I have been busy using a FREEBIE download that is still available on my blog post (till tonight, midnight MST), so hop over and grab it! I cut the base card on my Pazzles Inspiration and layered all the papers. I downloaded the Bingo card which I trimmed with a guillotine and adhered to my card. I printed the cute reindeer from a graphics set. Using the Print and Cut technique with my cutting machine I added him to my card. Just the addition of doodling, a purchased paper flower and some gorgeous twine my Christmas card was done!!!! For more photos and detail, please head over to http://ilove2cutpaper.blogspot.co.uk/ and I would love you to LIKE my facebook page by clicking on the link down the sidebar on the right hand side of my blog. It's been great popping by. Joanna, this card is fantastic! I am already a fan of yours but every time I see one of your creations, I'm even more impressed! lol...What a Super Duper Cute card!! !Love it!TFS Joanna!